“I learned this recipe from my friends at Ristorante Celeste in Treviso,” Francesco says. “It’s so beautiful.” Marinating the radicchio removes some of the bitterness from the vegetable and also intensifies the color. In Treviso they serve it with salami, but Francesco prefers it with prosciutto or octopus. 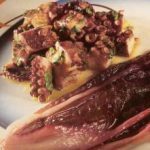 Place the octopus in a deep saucepan with the white vinegar, peppercorns, celery onion, and water. There should be enough water to cover the octopus. Add 2 or 3 wine corks. Drain the octopus and transfer it to a bowl of ice water. Slice the octopus in 1-inch (2.5 cm) pieces. Mix the olive oil, red wine vinegar, salt, pepper, and parsley together and toss with the octopus. Allow to marinate at least 1 hour. 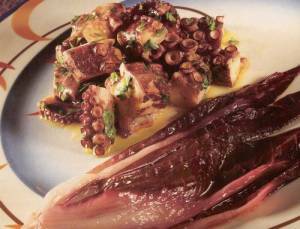 Serve the octopus with marinated radicchio on the side.